Are you sure you want to know? 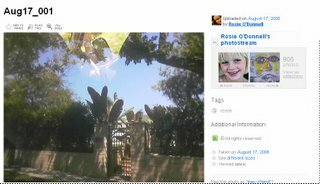 : Rosie O'Donnell and I are on the same Flickr Cycle! Rosie O'Donnell and I are on the same Flickr Cycle! I admit that I'm a geek. There's nothing wrong with that, it just is what it is, you know! So.....on my Flickr Page I've got Rosie O'Donnell listed as one of my friends....I don't know why she doesn't have me listed as one of hers though. I sort of fell upon her page by accident one day and I thought "how funny...I'll mark her as a friend"
She posts some very interesting pictures, it's funny to see "her side of things" (you know on the other side of the cameras kinda thing). She gets tons of hits on her flickr page, but then what do you expect from geeks like me....what really creeps me out though are the people that have her listed as a "friend" and then have favorited almost every one of her pictures. What's even creepier....those people who's only favorited photos are Rosie's......what's up with that? I've seen some folks who favorite every one of her pictures and have no other favorites....why would you favorite every one? That makes no sense. I'm glad I'm not Rosie! Well every now and again she'll show up on my "home page" that shows my "friends" who have just updated their pictures....whenever she shows up there I always look...and guess what...I was the first one to look at the pictures she just posted...how creepy am I? Some are pretty good but others are just crappy ones taken from her cell phone!